Chances are, no matter which DPS school you are a part of — whether as a student, family member, teacher, leader or support staff — you believe that Denver can be a city where Every Child Succeeds. You believe in the life-changing power of public education. You care about developing lifelong learners who grow up to participate in a world full of opportunity. No matter which school you’re a part of, you’re a part of the DPS family of schools, and for that, I am very thankful. Are public schools that enroll students through the same DPS SchoolChoice process. Serve all students, including students learning English and students with disabilities. Are taxpayer-funded at the local, state and federal levels. Are held accountable to the same school performance standards, including the DPS School Performance Framework (SPF) and the Colorado state accountability clock. Are accountable to the Denver Board of Education. While we hold these common beliefs, in DPS we know that there is more than one way for a school to be great. Although our schools share many common foundations, it’s essential that we empower each school with flexibility, since they work closest with their students and know what’s best for them academically, emotionally and socially. Within the family of schools, we welcome different types of school leadership and governance, curricula, instructional models, school-year calendars, professional learning opportunities and more. Our shared goal of providing Great Schools in Every Neighborhood guides our district’s decisions — as we saw this week with the Denver Board of Education’s charter renewals and review of new school applications through the Call for New Quality Schools — by keeping us focused on shared accountability for student achievement and providing opportunities for continuous improvement. As in most families, there have been both uplifting and challenging moments within the DPS family of schools. Our schools have different views on many aspects of how to provide a high-quality education to students — but at the end of the day, that diversity of ideas and approaches is both a strength and an opportunity to put Students First. I’m grateful for each of you and the diverse ways our family of schools serves all Denver kids. Happy Thanksgiving to you and your loved ones. Pictured above: Students from KIPP Northeast Elementary, a charter school in the Family of Schools. Have you ever heard of Oobleck? It’s a creation of none other than Dr. Seuss, who wrote of the “gooey green substance” in a 1949 book. 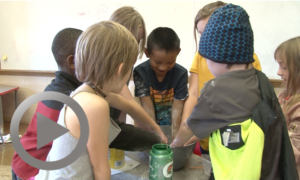 Oobleck has recently taken on new life in science classrooms across the country, including one at REACH Charter School where third- and fourth-grade students created the part-liquid, part-solid creation with cornstarch and water. Watch our latest episode of ¡Somos DPS!, then nominate your school for the next episode by emailing Ben McKee. As a way of giving thanks to veterans for all they have done for our country, 929 students in 10 DPS JROTC programs participated in Denver’s annual Veterans Day Parade. 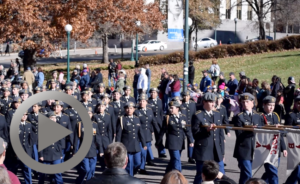 Denver JROTC Deputy DAI Kevin Black interviewed several DPS high school students who marched in the parade to learn why they believe recognizing veterans is important. Watch this DPS Features video to hear some of our students’ inspiring answers. Teachers from across the district were honored at the Excellence in Teaching event on Wednesday. On Wednesday, DPS celebrated nearly 1,200 of our educators for their high performance in the classroom and with our kids during the Excellence in Teaching event. The annual event — held at the Punch Bowl Social and made possible thanks to the DPS Foundation — recognizes teachers and specialized service providers who received a Distinguished or top rating in their growth and performance for the 2017-18 school year. All of our Distinguished educators were invited, along with a guest, to be celebrated, thanked and recognized for their excellence in the classroom. The number of Distinguished educators is continuing to increase every year in DPS, which means more of our kids have a top educator supporting them. One of the most important ways we help our students learn and grow, and achieve their own greatness, is to make sure they have a great teacher in every classroom. To help our educators grow professionally, we know that recognizing and honoring their efforts go hand-in-hand with coaching and supports. Congratulations to all of our Distinguished teachers and top specialized service providers! 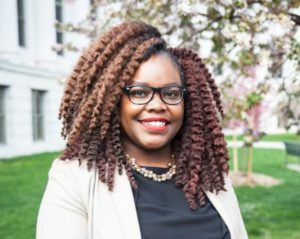 Shontel Lewis, a leader on the Family and Community Engagement (FACE) team, has been elected to the Board of the Regional Transportation District (RTD) for District B. Shontel campaigned on a commitment to prioritize people over process, to make transit affordable and available and to bring RTD closer to the communities it serves. Shontel grew up in Five Points and graduated from Manual High School. 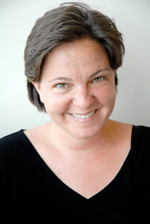 She is now the Associate Director of Community Engagement Strategy and Advocacy for DPS. At DPS, we understand the importance of a good partnership with RTD and how critical public transit is to meet our students’ transportation needs. Congratulations to Shontel! Dec. 12: Second African-American Young Ladies Summit – Register Today! Lo más probable es que, independientemente de la escuela de DPS a la que pertenezca, ya sea como estudiante, familiar, maestro, líder o personal de apoyo, tiene la convicción de que Denver puede ser una ciudad donde se logra el éxito de todos los estudiantes. Cree en el poder transformador de la educación pública. Para usted es importante formar a aprendices de por vida que crecerán para participar en un mundo lleno de oportunidades. Independientemente de la escuela a la que pertenezca, usted forma parte de la familia de escuelas de DPS y, por este motivo, estoy muy agradecida. Son escuelas públicas que inscriben a estudiantes a través del mismo proceso EscojoMiEscuela de DPS. Ofrecen servicios a todos los estudiantes, incluyendo a los estudiantes que están aprendiendo inglés y a los estudiantes con discapacidades. Están financiadas por los contribuyentes a nivel local, estatal y federal. Se rigen por los mismos estándares de desempeño escolar, incluyendo el Marco de Desempeño Escolar (SPF) de DPS y el sistema de responsabilidad del estado de Colorado. Responden ante el Consejo de Educación de Denver. Aunque compartimos estas creencias, en DPS sabemos que hay distintas maneras de que una escuela sea excelente. A pesar de que nuestros centros escolares comparten varias bases comunes, es fundamental que empoderemos a todas las escuelas a fin de que tengan flexibilidad, ya que trabajan estrechamente con los estudiantes y saben lo que es mejor para ellos desde el punto de vista académico, emocional y social. En nuestra familia de escuelas, adoptamos distintos tipos de liderazgo y administración escolar, planes de estudio, modelos de instrucción, calendarios del año escolar, oportunidades de aprendizaje profesional y más. Nuestra meta de proveer escuelas excelentes en todos los vecindarios guía las decisiones del Distrito, tal y como vimos esta semana con las renovaciones de escuelas chárter por parte del Consejo de Educación de Denver y la revisión de solicitudes de nuevas escuelas mediante la convocatoria a nuevas escuelas de calidad, al mantener nuestro enfoque en la responsabilidad compartida de alcanzar el logro estudiantil y proveer oportunidades para mejorar continuamente. Como en todas las familias, en la familia de escuelas de DPS ha habido tanto momentos estimulantes como desafiantes. Nuestras escuelas tienen distintos puntos de vista sobre varios aspectos relacionados con la manera de proporcionar una educación de alta calidad a los estudiantes; pero, al fin y al cabo, la diversidad de ideas y enfoques son tanto una fortaleza como una oportunidad para poner a los estudiantes primero. Estoy agradecida con cada uno de ustedes y las distintas maneras en que nuestras escuelas sirven a todos los niños de Denver. Les deseo un feliz Día de Acción de Gracias a usted y a sus seres queridos. Arriba: Estudiantes de la Escuela Primaria KIPP Noreste, una escuela chárter de la familia de escuelas. ¿Ha escuchado alguna vez hablar de un Oobleck? Es una creación nada menos que del Dr. Seuss, quien escribió un libro en 1949 acerca de una “sustancia verde pegajosa”. El oobleck ha recobrado una nueva vida en los salones de ciencias de todo el país, incluyendo en la Escuela Chárter REACH donde los estudiantes de tercer y cuarto grado crearon una sustancia mitad líquida y mitad sólida con almidón de maíz y agua. No se pierda nuestro último episodio de ¡Somos DPS! y luego envíe un correo electrónico a Ben McKee para que su escuela aparezca en el siguiente episodio. A fin de dar las gracias a los veteranos por todo lo que han hecho por nuestro país, 929 estudiantes de 10 programas JROTC de DPS participaron en el Desfile Anual del Día de Veteranos de Guerra de Denver. El representante DAI Kevin Black de JROTC de Denver entrevistó a varios estudiantes de preparatoria de DPS, que marcharon en el desfile, para conocer por qué creen que es importante reconocer a los veteranos de guerra. No se pierda este video de DPS Features para escuchar las inspiradoras respuestas de nuestros estudiantes. Se ofreció un reconocimiento a maestros de todo el Distrito durante un evento celebrado el miércoles titulado Excelencia docente. El miércoles, DPS ofreció un reconocimiento a casi 1,200 maestros por su alto desempeño en los salones de clases y por su labor con los estudiantes durante un evento titulado Excelencia docente. 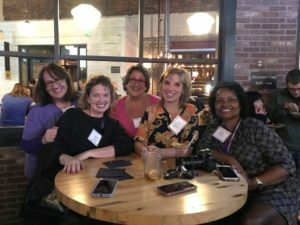 El evento anual, celebrado en Punch Bowl Social y hecho posible gracias a la Fundación de DPS, reconoce a los maestros y proveedores de servicios especializados que recibieron una clasificación de Distinguida o superior en lo que a su crecimiento y desempeño durante el año escolar 2017-18 se refiere. Se invitó a todos nuestros maestros, quienes podían venir acompañados de un invitado, que obtuvieron una clasificación de Distinguida para recibir un reconocimiento y agradecimiento por su excelencia en el salón de clases. El número de maestros que obtienen una clasificación de Distinguida continúa incrementándose anualmente en DPS, lo que significa que una mayor cantidad de nuestros estudiantes cuentan con el apoyo de maestros excelentes. Una de las maneras más importantes en que ayudamos a que nuestros estudiantes crezcan y aprendan, y alcancen su propia excelencia, es garantizar que haya maestros excelentes en todos los salones de clases. A fin de contribuir a que nuestros maestros se desarrollen profesionalmente, sabemos que reconocer y premiar sus esfuerzos debe ir acompañado de capacitaciones y apoyos. Enhorabuena a todos los maestros que obtuvieron una clasificación de Distinguida y a nuestros excelentes proveedores de servicios especializados. Shontel Lewis, líder del equipo de Enlaces Familiares y Comunitarios (FACE), ha sido elegida para servir en el Consejo de Regional Transportation District (RTD) del Distrito B. La campaña de Shontel giró en torno a un compromiso para dar prioridad a las personas sobre el proceso, lograr que el transporte sea asequible y hacer que RTD llegue a las comunidades a las que sirve. Shontel se crio en Five Points y se graduó de la Escuela Preparatoria Manual. Ahora es la directora asociada de Estrategia y Apoyo de Participación Comunitaria de DPS. “Quiero asegurarme de que se escuche la opinión de todos los constituyentes y de que sean considerados como socios cuya supervivencia depende del éxito del transporte público en nuestro distrito”, comentó Shontel. “Durante más de 14 años, he trabajado en varias disciplinas, incluyendo el transporte público, la educación pública, el desarrollo económico y el liderazgo juvenil a través de agencias y organizaciones comunitarias. A menudo, estos sectores se solapan, pero cada uno de ellos trabaja de forma aislada y se pierden oportunidades de colaboración”. En DPS, entendemos la importancia de contar con una buena alianza con RTD y el papel fundamental que el transporte público juega para satisfacer las necesidades de transporte de nuestros estudiantes. ¡Enhorabuena, Shontel! 12 de diciembre: segunda Cumbre de jóvenes afroamericanas. ¡Inscríbase hoy mismo!